Marvel and Netflix provided us a quick tease yesterday, presenting us with our first look at the upcoming series Daredevil. The teaser effectively had fans chomping at the bit, waiting for the full trailer reveal to follow the next day. We’ve been following the production of Marvel and Netflix’s four limited series very closely, with Daredevil hitting our screens first in April. The actual trailer dropped early this morning, and gave fans and haters alike their first official glimpse at the tone of the show, and some of the actors involved, while still keeping a few things pretty close to the vest. Check out the trailer below before we get into any specifics. The trailer introduces us briefly to Matt Murdock, played by Charlie Cox. We don’t get too into his power set or even his origin, but are offered a few glimpses at the man himself, and his mission in Hell’s Kitchen. The city is as much of a character in this trailer as the few reveals we see of Deborah Ann Woll’s Karen Page, or even Elden Henson as Foggy Nelson. Foggy is Murdock’s partner-in-law, best friend, and usually the holder of DD’s ‘closely guarded’ secret identity. Another character we have been waiting to see – and by all accounts one who shares as much of this origin story as ol’ hornhead himself – is Vincent D’Onofrio’s Wilson Fisk AKA The Kingpin. 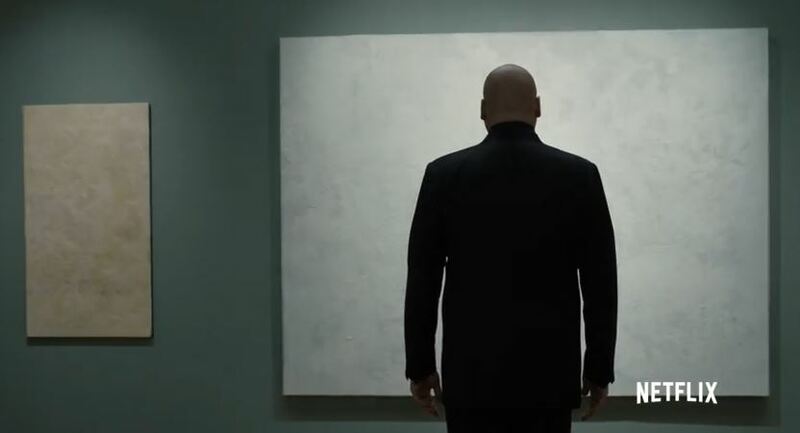 We see a brief shot from behind, with the iconic bald head and imposing frame standing out for a few seconds before the trailer moved on to some action scenes and shots of Cox in his first Daredevil outfit, which is inspired by Frank Miller’s run on the Daredevil comic series. This is clearly a dark series, with some similarities in tone to the CW’s Arrow, and it looks like it will be an interesting departure for Marvel. The studio to this point has relied on the humor and light-heartedness of their other characters across the MCU, both on TV and the big screen. While there is still a lot left to be seen about the show, like how Daredevil’s powers will look on screen and the appearance of his iconic red costume, or even any footage of Rosario Dawson’s character, who has remained something of a mystery since she was cast months ago. All in all this first trailer does exactly what it’s supposed to do; it gives us an idea of what we can expect from the show in tone and action, while keeping a lot of things under wraps and leaving us wanting more. What did you think of the first trailer for Marvel’s Daredevil? Let us know in the comments section below or on the GrizzlyBomb Facebook Page! Marvel’s Daredevil hits Netflix in its entirety on April 10th, 2015.